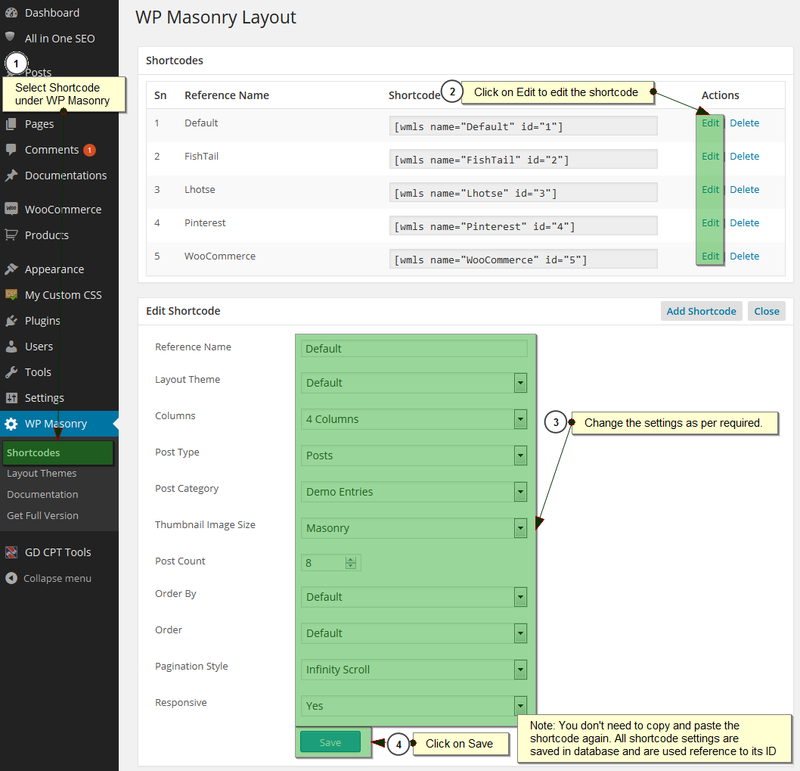 You can also search Wp Masony Layout from Plugin > Add New > Search and install it directly from Wordpress Repository. Please make sure to deactivate and delete the lite version before using Pro Version. Reference : If you are new to wordpress plugin installation, please refer to this detailed documentation. 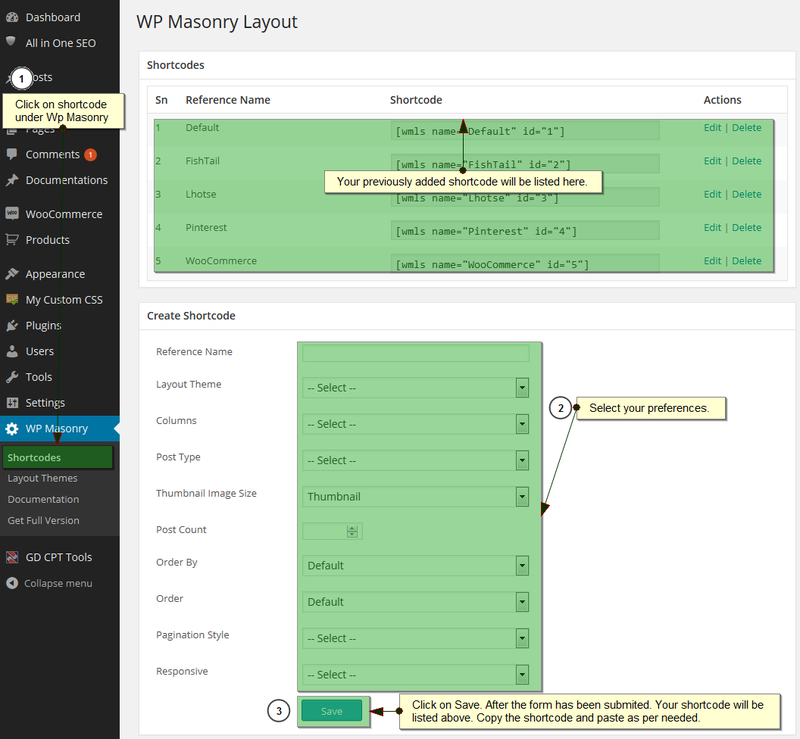 You will find the plugin admin menu WP Masonry under settings of Wordpress Admin Menu. Use Shortcode menu to goto shortcode generation page. Use Layout Themes menu to get the list of available themes. From there you can check demo, edit theme settings and move those files to your Wordpress Theme. Use Documentation menu to goto the plugin documentation page. Under Create Shortcode Section, select the options as per your preferences. Your shortcode will be added to Shortcodes section. Copy the shortcode and place it in your post / page editor or in theme template files. Generic shortcode can be used in Category, Archive, Search, Tags, Author and many more templates. It can be used in even custom taxonomy templates. For example, if you keep this shortcode in category.php template. All your category listing will be displayed in masonry layout. Click on Edit to edit the shortcode or Delete to delete. Note : You don't need to copy/paste the shortcode after the settings has been changed. The shortcode remains same. Click on Demo for the theme working demo. Click on Edit Settings to change the settings of Masonry Theme. 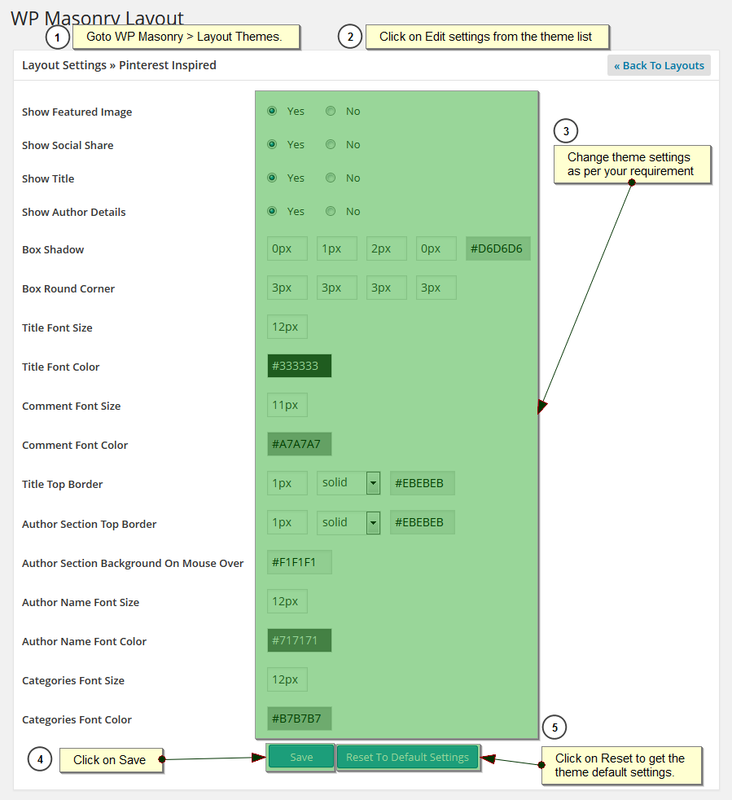 You can add/remove section, change color, font size and more. Click on Copy To Wordpress Theme to copy masonry theme to your active Wordpress theme if you need to customize it. It makes safe for customization and you changes remains same even after the plugin is update. Click on Edit Settings from theme list. Change the settings as per required. Click on Reset to Defaults to get the default theme settings. From version 1.6, we have Custom Query field. If you ever need extra filters like tags, author or custom taxonomies, you can keep them in Custom query box. Custom query parameters works as wordpress Wp Query paramters. For details about accepted parameters, you can visit Wordpress Codex page here. We currently have only 1 filter. Use this filter to write custom query for your shortcode. You can also write custom query based on shortcode Id. You need to write these code in functions.php of your wordpress theme. If you want to write custom query for specific shortcode, you can use like this. Click on Copy To Wordpress Theme. Once the theme has been copied, confirmation message is displayed with the new location of the copied theme. Now you can customhouse theme as per needed and will be safe from future update as well.